Norm Hoover’s turkey is result of years of both hunting and shooting. Then President Eisenhower made these remarks at the Pageant of Peace Ceremonies during the lighting of the National Christmas Tree. It was broadcast live over the radio and television at 5:15 p.m. that night. The whole speech should be read in its entirety and can be found online by searching for Dwight D. Eisenhower remarks at the Pageant of Peace Ceremonies. 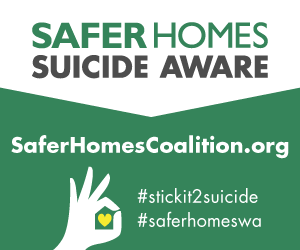 You should not only read it for yourself but also for your children and grandchildren. History, ideas, thoughts and hopes of the past are being lost because it is not being taught in school. If we don’t teach our children, who will? This year in Pennsylvania and most of the country was the year of the rain. The muzzleloading shooting events still went on but with a lot of hardship because of the water. The National Muzzle Loading Rifle Association event had high water at the National Shoot at Friendship, IN. The NMLRA 18th Century Market Faire and Rifle Frolic was blessed by four good drying days before the event and actually had dry weather for all of Friday and Sunday. Saturday not so much, it would rain for about a half hour and be dry for a half hour then rain again. People kept shooting and it was a great event and there will be more about it in next month’s issue. In all through the summer and fall why would I think Pennsylvania’s early muzzle loading deer season would be any different? Pennsylvania is a great state to hunt with a muzzleloader; it has an early scoped in-line muzzle loading season which was Oct. 13-20. It is antlerless only which you need a special permit which is management area specific along with a muzzle loading license. During this season you can hunt for antlerless deer with a scoped in-line muzzleloader or any muzzleloader. Flintlock or percussion rifles with any sights or optics and ball or bullet are allowed. 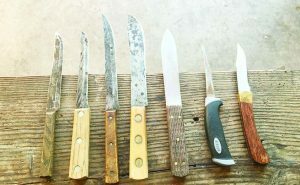 Several different knives the author uses to skin, butcher and bone a deer. He uses the four on the left that are carbon steel and rust, but in general they are a lot cheaper and stay sharper longer than most cheap stainless steel knives. The three on the right are stainless steel. The one with the beaver tail blade is a Green River blade and it is stainless and stays sharp and is a heavy blade that author likes to use to quarter the deer up with and separate the bone from the sockets. The far right is the NMLRA Buck 101 Hunter with a full tang. It is a fixed blade and he has not sharpened it since owning it. It is a good knife with which to gut, skin, and trim your meat when butchering. I have hunted in this season many times with an in-line muzzleloader. Usually when it’s rainy, or if I want to make meat, that is what I use to hunt. I have also hunted many times with a Thompson Center flintlock Hawken that I re-barreled with a .54 cal. Getz barrel that is 32 inches long. I also put in a drop-in L&R lock and it shoots great. I shoot my flintlock deer rifles in several matches throughout the fall to make sure they are still sighted in perfectly. But unfortunately I did not do that with my muzzleloading in-line. But with rain in the forecast for the next 5 days I put my old .50 cal. Austin and Halleck in-line in and my .54 cal. T/C Hawken in the truck for the hunt. I drove through 2 hours of heavy rain on the first Saturday of the season to get to where I was hunting and the “Weatherman” said it was going to clear off by noon. It was raining that hard I chose to load the in-line up which uses a 209 shotgun primer for ignition. But I still wrapped the action with my 12” X 16” piece of oil cloth which I use to cover my flintlock actions in the rain. I have found canvas or oil cloth the best. You want something that beads water and doesn’t let stick to the material, plastic is the worst. As a kid I used to use plastic bread bags, sandwich bags, that is the worst. Once the plastic is wet on the inside and out in attracts more water and doesn’t repel water like canvas or oilcloth. Hunting all day and the rain never stopped like the “weatherman” had said it would. It was getting late and I was walking back a log road when walking parallel to me through the woods at about 60 yards not noticing me at all were three deer. Finally I got lucky and found a dumb deer I picked the largest antlerless deer and waited for the perfect shot. I touched it off and I missed! How? I looked down all around at the ground no sign of a blood, no sign of nothing. I made bigger and bigger circles and went back again looking at the trees for any hits if I missed where? I spotted in a tree that had to be just over the deer’s back my mark made by my 300-grain ballistic tip Hornady bullet. The mark was fresh and was mine. In Pennsylvania you are not allowed Sunday hunting so I made a quick trip to the range. I posted two NMLRA 100-yard targets above another one at 50 yards. Then I went back and loaded up my deer load of 80 grains of FFFg GOEX and a 300 grain Ballistic Tip Hornady. After the shot, I hit about 17 inches high! I took the scope cap off to make an adjustment and it all came back to me like a bad dream. I instantly remembered when I saw the black, white and red dots. 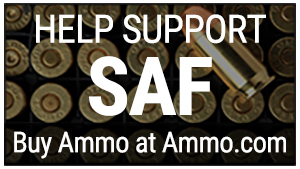 I had shot the rifle in the first in-line muzzle loading shoot the NMLRA ever had to support them out at Friendship. The match then was 50 yards, 100 yards, and 200 yards bench and 300 yards with pig silhouettes. I shot that match and never returned my sights from the 300 yard setting. I clicked the sights back to the 50-yard black dot setting and up and down was perfect and was still about 2inches to the right; made another move and it was perfect. Monday I went back to the same spot and as I had missed the one on Saturday. There was another one standing about 80 yards broadside. I took my time and shot and the bullet hit where I was aiming. The deer still did a 75-yard downhill death run before it stopped. It was dead on impact; the ballistic tip hit a rib on the way in and destroyed lungs, heart, and liver all in one shot. I got the deer home that night and hung it up and skinned it and washed it out good. The next day I cut the meat up. One hind quarter goes for steaks and cubed for stew meat. One hind quarter goes to be smoked and dried then chipped. The tenderloins, chops, and several roasts for the crockpot pot roast, rib roast, and shoulder roast and everything gets boned out to deer burger. Butchering a deer isn’t hard. All jobs are easy if you know how to do them. Get a good butchering chart and start in; you will get good with time. Good sharp knives are always important both for skinning and butchering. Look at the picture of knives. This deer is all cleaned, butchered and put away in the freezer and I am waiting for the flintlock season which will start here in Pennsylvania the end of this month. 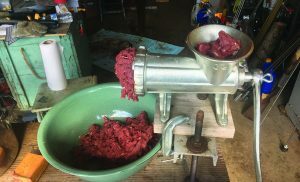 The old hand-crank meat grinder still works great. Hunting with a muzzleloader involves all the same hunting skills as you hunt with a modern rifle or shotgun. 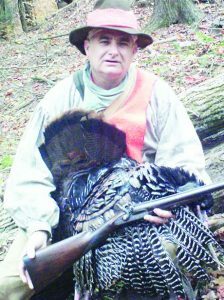 Norm Hoover is a great turkey hunter with a modern shotgun, so it was an easy transition with the muzzle loading shotgun. Norm worked up loads for his muzzleloader that he knew from experience would kill a turkey. If you don’t have enough experience to shoot pheasants or ducks on the fly with a modern firearm, a muzzleloader isn’t going to make it easier. I did discover that when we were hunting eiders in Maine Bismuth shot in our muzzleloaders killed better and cleaner then steel shot did in modern guns. Muzzleloading gun clubs in Pennsylvania where very popular along with the archery clubs. The clubs where needed for people to practice for hunting with their flintlocks and their compound bows. But when the in-line muzzleloaders came into being, the practice level dropped off because of the quick ignition and the ease of using a scope for sighting. Because of my experience I had I will always take the in-line out and shoot it before the season. Archery is the same way with the crossbow. The crossbow is a simple tool for shooting deer. Once it is sighted in with its scope no real practice needs to be done to maintain muscle strength as it was years ago with the recurve. There are many people who have come into our sport through the in-line muzzleloaders and crossbows but there are a lot who have stopped and gone no further than using these modern devices to extend their hunting season. It will be up to the next generation of club officers and members on how to lure these hunters back into their local clubs.